On this date in 1066, the Jewish vizier of Granada Joseph ibn Naghrela was lynched during a notorious pogrom. His (more illustrious) father, the scholar, courtier, and battlefield commander Samuel ibn Naghrela (or Naghrilla, or Ha Nagid), had become the trusted vizier to the Berber emirs of the taifa of Granada in Islamic Spain. Samuel helped to manage the transition to the (present-day, for purposes of this post) emir Badis or Badus when the latter was a whelp of 18. This was the golden age of Jewish culture in Spain, thriving in an atmosphere of relative tolerance. Needless to say, the nature and extent of this religious harmony and the weight of contrary but uncommon events like that of today’s post are fodder for lively contemporary debate that gores oxes both historiographical and geopolitical. 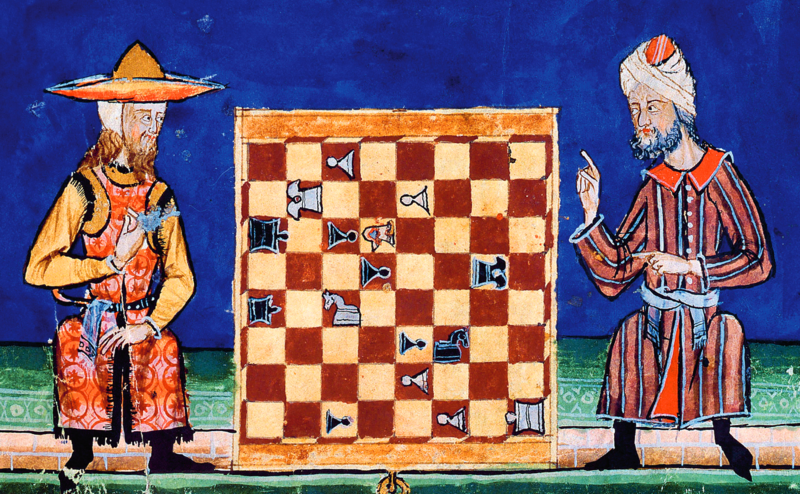 A Jew and a Muslim play a nice game of chess in this 13th century illustration commissioned by the Christian King Alfonso X. It’s an exemplar of the late Middle Ages era of interreligious “Convivencia”. and counts it a religious duty to give advice. when he could, had he wished, have chosen a Believer. and this happened suddenly, before they even realized it. the vilest ape among these miscreants. but through one of our own people who rose as their accomplice. the example set by worthy and pious leaders? to shroud their dead for burial. or paraded along with the intimates of the ruler. and your judgment is sure and accurate. when they are trumpeted all over the land? when they have made you hateful to all the world? when they destroy as you build? and made him your companion — though he is evil company? a warning against the society of the wicked. but leave them to the curse of the accursed! and is about to heave and swallow us all. and you will find the Jews are outcast dogs. when in all the land they are kept afar? as your forebears were first in their time. and I saw them frolicking there. with one of their accursed men everywhere. they munch and they crunch. while you wear the meanest. –yet how can traitors be trusted? while they are near, and dine well. and they are not stopped or reproved. and you neither see nor hear. and led the finest spring water to it. and we stand at his door. and we return to our God. as yours, I would speak the truth. for they have amassed every precious thing. for you have a better right to what they collect. –the breach of faith would be to let them carry on. so how can you be held guilty against violators? when we are obscure and they are prominent? as if we had done wrong, and they right! for you are surety for what they do. and the people of God will prevail. The enraged mob stormed the palace where Joseph vainly hid himself in a coal pit — murdering the hated counselor and displaying his corpse on a cross. A general pogrom has been credited with killing some three thousand Jews around Granada.